Originally trained as a dancer Fay has enquired into the moving body most of her life. She trained in Cecheeti Ballet from a young age and later went on to study contemporary dance in her early teens. At 18 years old she spent 4 years training in Choreography, Performance and Dance movement techniques whist working as a Professional Dancer alongside. Fay offers a wealth of experience in anatomical alignment, movement development and dynamic phrasing. Fay has had a regular Mysore practice that led her to greatly value the benefits of self practice Ashtanga with her main teachers Bret Porzio and Matt Corigilian. This gives her students tailored adjustments, a safe practice and facilities their potential growth. Fay has delved deeply in the study and consideration of yogic philosophy/texts and healing through movement. Fay believes that we can heal and nourish our bodies. 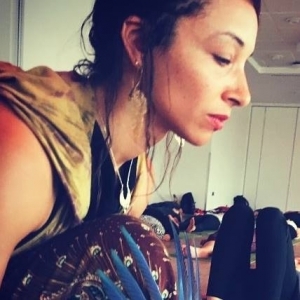 Her enquiries allow her classes to evoke deep thought and care around how we use our yoga to inspire us; but also how we can live a more connected existence allowing us the freedom to make choices that better support our lives – thus our spirit. 500 hours Advanced Yoga teacher training at triyoga London with Anna Ashby and Jean Hall. 100 hours Anusara Teacher Training Immersion at triyoga, London. With Bridget Woods Kramer. 200 hours Teacher Training at triyoga, London. With teachers Anna Ashby and Joey Miles. 33 hours of Restoritive Yoga Teacher Training at triyoga, London. With Anna Ashby. I teach Vinyasa Flow Yoga that is embedded in Tantric Philosophy. It is a deeply dynamic flow, inspired by dance, music and embodied movement. I will encourage connection between body, spirit, and mind. Transcending our awareness into our light of peace, to our awakened presence to help us to become clear and aligned with our highest potential.